Here are the publications that have resulted from my time as a research chemist. The graphics act as links to the articles on the various publisher sites. Speciation and reactivity of heptavalent technetium in strong acids. Photochemical behavior of the quadruply metal-metal bonded [Tc2Cl8]2-anion in acetonitrile. Aggregation of Heteropolyanions in Aqueous Solutions Exhibiting Short-Range Attractions and Long-Range Repulsions. p-SCN-BN-HOPO: A Superior Bifunctional Chelator for Zr ImmunoPET. Speciation of Technetium Peroxo Complexes in Sulfuric Acid Revisited. Structural aspects of heteropolyacid microemulsions. Insights into stabilization of the 99TcVO core for synthesis of 99TcVO compounds. Diperoxo Pertechnetic Acid Characterized by Spectroscopic and Quantum Chemical Studies. On the Nature of Heptavalent Technetium in Concentrated Nitric and Perchloric Acid. 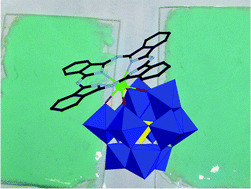 Ternary phthalocyanato Hf(IV) and Zr(IV) polyoxometalate complexes. Investigation into the extraction speciation of rare-earth radioisotopes from aqueous solution using polyoxometalates. A binuclear lanthanide complex consisting of two lanthanide binding domains linked by a m-xylyl bridging unit forms very stable 1:1 adducts with benzene dicarboxylic acids and their derivatives. The complex with isophthalate derivatives is particularly stable. In this article, imaging applications of luminescent complexes and recent advances in the design and photophysical behaviour of near-IR responsive complexes are reviewed. Various properties of the luminescent lanthanide complexes are also discussed in detail. (86 references). Reaction of 1-hydrazinophthalazine with chloroacetyl chloride yields 3-chloromethyl-1,2,4-triazolo-phthalazine. Reaction of this product with the tris tert-butyl ester of DO3A yields a triazolophthalazine appended macrocycle. Hydrolysis and complexation with lanthanide ions gives access to a series of lanthanide complexes (Ln = Nd, Eu, Yb, Er); these are all luminescent and exhibit sensitisation of the lanthanide centre by the chromophore. pH dependent self-association has been observed in a series of DO3A-derived lanthanide complexes bearing a carboxylate group that can act as a bridging ligand at high pH, switching on the luminescence from the lanthanide.